A. Individuals and groups from age 5 and up follow competition rules to play through the 18 holes (usually taking about an hour), each designed with varying levels of difficulty and a specific par. A point is added for each stroke it takes to sink the ball, with the lowest overall score winning. B. 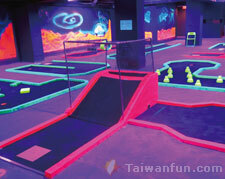 The cost is NT$200/person (groups of 6 people can play for the price of 5). 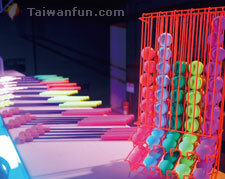 Each player gets a scorecard and florescent-colored ball and putter. 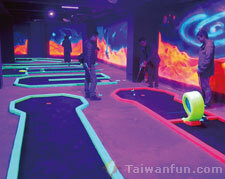 C. Each hole has its own sci-fi inspired name, such as "Asteroid Field", "Superman" and "Stargate".